Jenny Dickson, PA-C is a native of Stapleton, Georgia. She graduated with honors from Jefferson County High School in 2006 and obtained a Bachelor's Degree in Biology from Georgia Southern University in 2010. During her time as an undergraduate student at Georgia Southern, Jenny was one of the founding members of the Hearts and Hands Clinic, a non-profit clinic in Statesboro, Georgia that serves uninsured patients in Bulloch County. She continued to volunteer there for several years while obtaining her Master's Degree in Biology. She was also a Molecular Biology Initiative fellow in a National Science Foundation grant designed to help rural teachers by utilizing graduate students to teach Molecular Science through interactive labs. 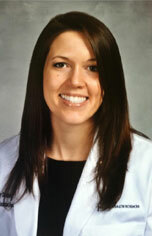 After graduation with her Master's Degree in Biology in 2013, Jenny went on to earn her Masters of Physician Assistant degree from Georgia Regents University (formerly Medical College of Georgia). As a PA student, Jenny received the prestigious Beard Award for Excellence in patient care and excelled in her academic and clinic training at Georgia Regents University. Jenny is an active member of the AAPA, GAPA, and GDPA. She enjoys jogging and mountain biking in her free time.